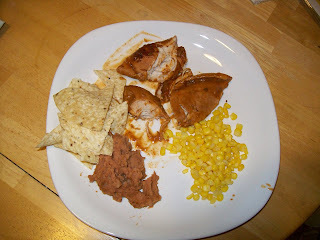 Frugal & Fabulous: Frugal Recipe - Salsa Chicken - Slow Cooker Thursday! Frugal Recipe - Salsa Chicken - Slow Cooker Thursday! Lay 4-6 pieces of chicken (basically whatever you can fit) in the bottom of your crockpot. Sprinkle the packet of seasoning over them. Top with salsa and then can of cream of chicken. Put crock pot on low* for 5-7 hours. (The longer it cooks the more tender it will be!) When ready to eat, add sour cream in crock and serve. Try serving it over rice, with black beans & corn or over nachos. *You can bump it up to high for a little bit but beware of burning! DH gave this an 8/10! I am going to try that next week, it sounds really good.